Friday night the contemporary music ensemble Sound Icon brought another adventurous and challenging work to a large and appreciative audience. 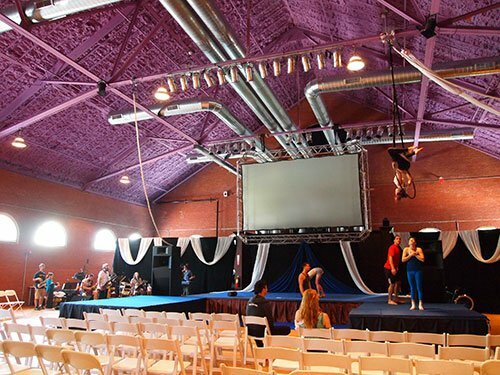 They commandeered the Center for the Arts at the Armory in Somerville to produce Le Noir de L’Etoile, a work from 1989 by the French composer G­érard Grisey (1946-1998) inspired by the sound emitted by pulsars. A pulsar is the incomprehensibly dense remnant of an exploded star. Collapsed in upon itself under such extreme gravitational forces that its atoms have been stripped of their electrons, it spins at a constant velocity, regularly emitting pulses of radiation, hence its name. Those pulses can be detected by radio telescopes, and the electromagnetic flashes emitted can be represented as sound pulses occurring in time. Grisey, considered a part of the “spectralist” group, first heard these pulses in 1985 and was instantly transported and sought to find a way to bring the pulsars into his work. The spectralists made musical works whose structure and material is drawn from the most basic elements of sound, typically deriving pitches from the “sound spectrum” of given instruments; such patterns of overtones make a trombone, for example, sound different from a clarinet. Le Noir de L’Etoile uses a limited palette of pitches, written only for percussion made of “skins and metals”, and instead the idea of regular pulsation is the point of departure for the piece. The work is spatial and theatrical in concept (Joshua Fineberg is given a credit for electronics, and Ryan Yorck as light and sound engineer). Upon entering the dimly lit, voluminous and lofty open space of the Armory, one could see six percussion stations arranged around the periphery. The seating was arranged in a rough square, all the seats facing towards the center of the space so that the percussionists (Jeffrey Means, Matt Sharrock, Robert Schulz, Nick Tolle, Aaron Trant, and Mike Williams) surrounded the audience, who faced one other. At the start of the piece, the lights dimmed and a recorded voice, presumably Grisey’s, emerged from the darkness to give an extended explanation of genesis of Le Noir de L’Etoile. Two pulsars were mentioned in particular, the Vela pulsar, named for the southern hemisphere constellation in which it appears, and 0359-54, named for its astronomical coordinates. Then a spotlight singled a player who commenced a low pulse, at a pace that seemed very similar to the pulsing period of 0359-54: a bit less than a beat per second. The Vela pulsar, which pulses at about eleven times per second, could be heard represented in sudden, loud rapid rappings that appeared over the slow pulse – sixteenth notes at a metronome marking of 168 is occur at about 11 times per second. From this point on the work develops inexorably—the initial opening section introduces much of the sound material that will occupy the work’s 50 or so. There is was sense of atavistic ritual—a predominance of struck sounds, with the occasional low groan from a bowed cymbal; brief, loud irruptions; regular return to previous figures, and an overall sense of uncompromising internal logic. Then the playing slowly stopped, giving way to a recording of the Vela pulsar. In one of the great surprises of the evening, it sounded animated, animalistic and fragile, characteristics that the music surrounding it did not possess. Vela’s signature reaches us from almost 1,000 light years away, and its weak residual energy must battle through the atmosphere to reach our telescopes, resulting in a sound that is not a monotonous ticking, but a slightly fuzzy beat that slips in and out of audibility, giving it an almost jazzy syncopation. Vela’s voice inspired extended outbursts in the percussion music, which edged towards the violent. After some time the music again subsided, and a recording slower beat of 0359-54 was played for us (in the premiere, 0359-54’s signal was received and amplified live, its constant throb occurring in real time). This inspired entirely new, with brushes and other materials dragged across surfaces producing overlapping washes. At some point the music moved into a fourth section, the boundary unclear, but with an increasing density of events until it ended with a simple coup de theatre – a light slowly illuminated a cymbal suspended in the very center of the hall, in the very center of the audience. One of the players suddenly appeared to strike it once; then silence, then darkness. The precise, clear, powerful, carefully inflected performance seemed definitive; Grisey’s often severe sound world was never harsh or abusive, but neither did it want for terrifying power when necessary. The acoustic of the hall suited the music well, with limited reverberation and excellent audibility from every percussion station. It is difficult after a single hearing be able to describe how the piece creates its logic, how it justifies the time it uses. Unattended to, the music might seem to have a simple and repetitive surface, but the structure seems circular, or even spiral: although there are constant returns to figures, they are not unchanged returns. The spatial element of the sound is a first-order element of its organization, not only in the thrilling moments where figures swirl around or dance across the space, but in the constant call-and-response that the spatial separation of the players. It is an impressive work, but one with a bit of intellectual chilliness to it—or perhaps it is better to say it is determined to be austere, and succeeds. Certainly the overflow audience responded rapturously—an audience, it is worth noting, that was far younger than those at almost any of the events covered by this publication. The auditors were curious and engaged as well. After the conclusion, the room remained quite full for some time, as knots of people gathered around the players at their performance stations, asking questions, experiencing sounds up-close, and talking about what they had heard. 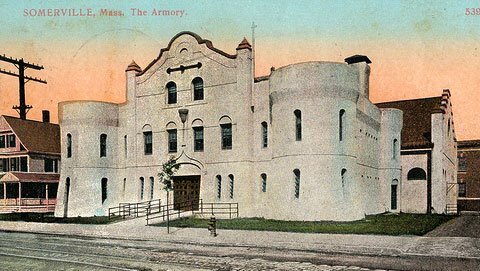 It might not have hurt that the concert was free and that the Armory served beer and wine before and after the show. Sound Icon, it is clear, is doing something very right: performing challenging and engaging new works for surprisingly large and engaged audiences. More Grisey is on tap in 2015, with three of the early movements from Les espaces acoustique being performed in March at Brandeis.